Photograph of Canadian soldiers, unknown location, May 1944. 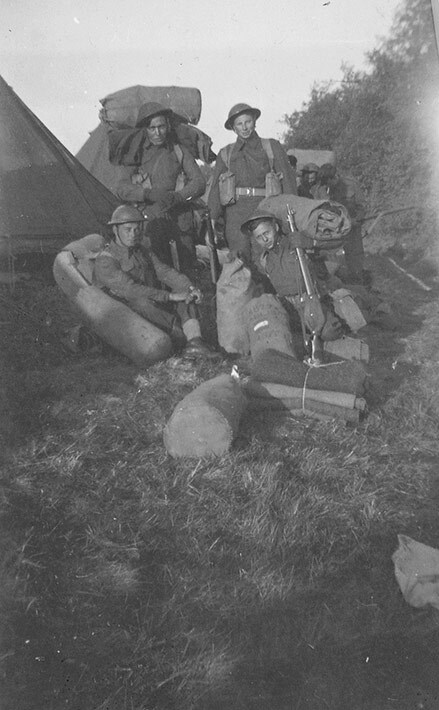 Four soldiers are pictured in uniform and with blankets and duffel bags. In the background, other soldiers are visible along with two tents. The environment seems to be a clearing in the woods. This photograph is part of a collection donated by Rino Albanese. At the age of 18, Rino Albanese and his twin Philip enlisted in active service with the Canadian military. They were trained at Petawawa, where most of the about 600 Italian Canadian internees were housed. At the same time, the twin's father, Giovanni was designated as an enemy alien. The brothers were sent overseas where they served with the Canadian forces in England, Holland, and Germany.